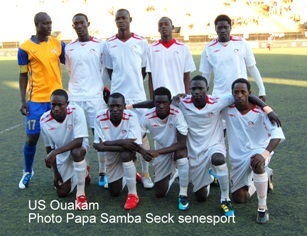 At the time of writing, US Ouakam are the surprise leaders of the Senegalese League 1. The Senegalese league is notorious for its lack of goals and the leaders have scored only seven goals in seven matches, which is actually the second best attacking record in the current campaign. US Ouakam, who comes from one of the suburbs surrounding Dakar, have never before won the Senegalese League 1. The club is perhaps most known for producing great players like Pape Malickou Diakhaté (Olympique Lyonnais, France) and Guirane N’Daw (Real Zaragoza, Spain). In this post I will present some of the players who deserve credit for US Ouakam’s impressive start to the season. New striker Sadio Diao, signed from AS Douanes, has already two league goals to his name. In 2008, Diao was regarded as one of the hottest strikers in the local league. He scored 5 league goals for AS Douanes in 2008, which is actually quite good by Senegalese standards. The seasons 2009 and 2010 went considerably slower and Diao will probably profit from the change of club. Experienced defender Francois Diokh has been a key player for US Ouakam for at least five years and is regarded as one of the key players at the club. Diokh was part of the Senegal U-23 national football team back in 2006 and has training regularly with the Senegal B national team in 2008 and 2009. Diokh can play both in central defence and at full-back position. Diokh is also known as Jean Francois Diokh. The current captain of US Ouakam is defender Moussa Dione, also known as El Hadj Moussa Dione. When US Ouakam won their latest trophy, the Coupe Nationale 2006, both Moussa Dione and Francois Diokh was part of the defensive line. This kind of defensive stability is quite rare in African football and is one of the success factors of US Ouakam. Dione was part of the Senegal B national football team in 2008. Dione can also play in midfield positions. Gueye is an attacking midfielder who has played for US Ouakam for several seasons. He is currently a key player at the club. Koukpaki is the current top goalscorer at the club with three goals during the first seven rounds. The veteran striker, born 02.04.1979, is actually most known as a beach football player, participating in the 2007 and 2008 Beach Soccer World Cup. Koukpaki played for US Ouakam back in 2005 and has also played for ASC Diaraf. There are not many foreign players who are key players in the Senegalese League 1. Karifa Kourouma from Guinea is one of them. Kourouma is a left-winger / attacker who joined US Ouakam during the 2010-season. He is known for his speed, his dribbles and his creativity. Although Kourouma impressed straight away, he has explained that it was difficult to cope with the more physical Senegalese league. Kourouma hopes the toughness he is learning in Senegal will prepare him for a move to a European club. Kourouma has been somewhat criticized for his poor finishing but he scored his first goal for US Ouakam on 03.01.2011 against ASC HLM. Kourouma is part of the impressive attacking trio together with Diao and Koukpaki. Midfielder, signed from CSS Richard-Toll before the 2010-2011. Mané has already established himself as a regular member of the first team. The veteran goalkeeper Ndiaye, born 31.01.1977, a former player of the Senegal national football team, is a key player for US Ouakam, which he has been for several seasons. Ndiaye has also played for the Senegal B national football team in 2008 and 2009. The young left-back is arguably the hottest selling prospect of US Ouakam, perhaps together with Karifa Kourouma. Ndiaye was part of the Senegal U-20 national football team in September 2010 and was training with the Senegal B national football team in January 2011. Ndiaye is a skillful and attacking minded full-back who could achieve great things if he manages to improve his physical presence. Sylla is a tough defender, born 22.02.1985, signed from Renaissance Sportive de Yoff before the 2010-2011 season. Sylla is already established at US Ouakam. Touré is an experienced midfielder who has been part of US Ouakam for at least five seasons. The picture is taken from http://www.senesport.info.